The FORCE Test should be performed by the recruits for the second in week 8 of their training to see if they have improved or not. I have to admit that my improvement was even a surprise to myself. All the PT sessions and hard work paid. 1- Rushes of 20 m.: In this test the person runs between marked distances of 10 meters and every time he or she has to touches the line with his front foot first and then touches behind the line with both hands. 2- Sandbag Lift: The person has to lift sandbags of 20 Kg which are put aside in a distance of 1.25 m., to height of 1 m. for 30 times in a specified time. 3- Loaded Shuffles: In this test the person has first take a sandbag of 20 Kg to the other side (I guess 20 m.) and return it, only while walking and then drops it and runs the same distance. This should be repeated twice. 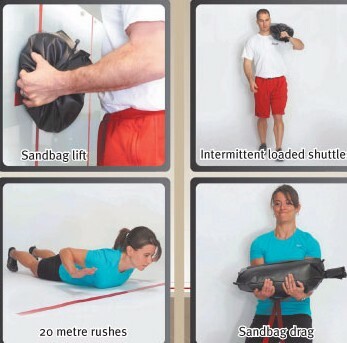 4- Sandbag Drag: This, which feels the hardest one, is dragging a dummy made of four 20 Kg sandbags. The person has to carry one with his or her hand, increasing the weight to 100 Kg. My time for the first part was 00:33 min. while the fastest person in the group got 00:29. It was possible for me to get closer to that. My time for the second part was 00:57 which was not bad at all. I don't recall the 3rd and 4th times but I was told by the examiners that I declined on the forth test. Overall I fall under Silver section with only 20 points from Gold which is a significant improvement from the first one.